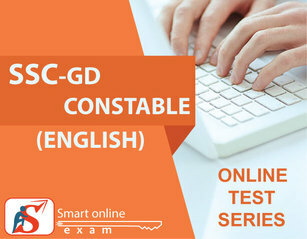 SSC Constable GD English is a wonderful opportunity for you to turn your dreams into reality! Get all information about SSC Constable GD - syllabus, preparation test, apply form, exam dates, admit card, latest exam pattern online test series and results here. Kick start your preparation now. Analogies, Similarities and Differences, Spatial Visualization, Spatial Orientation, Visual Memory, Blood Relation, Discrimination, Alphabet or Word Test, Syllogism, Observation, Relationship Concepts, Ordering and Ranking, Arithmetical Reasoning and Figural Classification, Arithmetic Number Series, Puzzles, Direction and Distances, Non-Verbal/ Verbal Series, Coding and Decoding, Clock and Calendar, Venn Diagram. Sports, History, Culture, Geography, Economic Scene, General Polity, Indian Constitution, Scientific Research, Current Affairs, Static GK. Spot the Error, Fill in the Blanks, Synonyms/Homonyms, Antonyms, Spellings/Detecting Mis-spelt words, Idioms & Phrases, One Word Substitution, Improvement of Sentences, Phrase Replacement, Active/Passive Voice of Verbs, Conversion into Direct/Indirect narration, Shuffling of Sentence parts, Shuffling of Sentences in a passage, Cloze Passage, Comprehension Passage.